Today I am here with Broccoli Biryani. 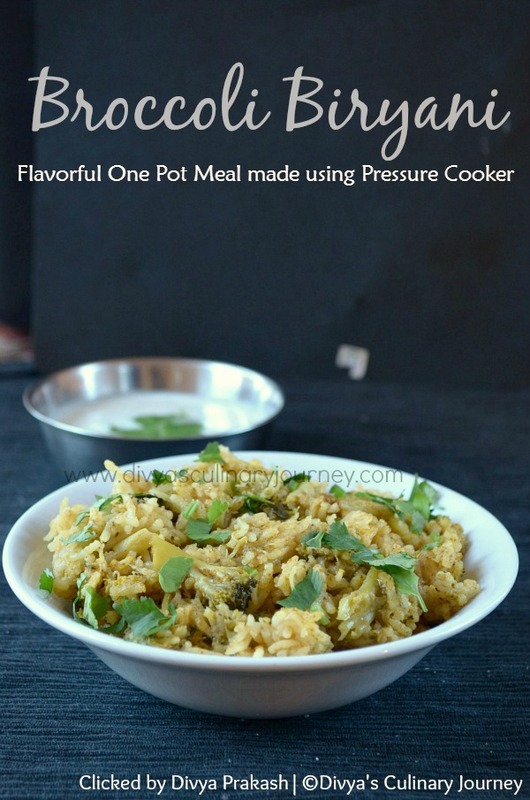 It is a flavorful one pot meal made using Pressure Cooker. It is quick and easy to prepare and is delicious too. If you do not want to spend much time cooking in the kitchen, but want to eat a delicious meal, then this biryani is for you. My family loves Broccoli and I always look for different recipes to try it. This weekend I was too lazy to cook anything elaborate, then I made this Broccoli Biryani and served with Raitha and boiled egg. My family loved it. Though Biryani is Vegan, raitha and egg are not vegan. So If you are looking for vegan option choose your side dish accordingly. 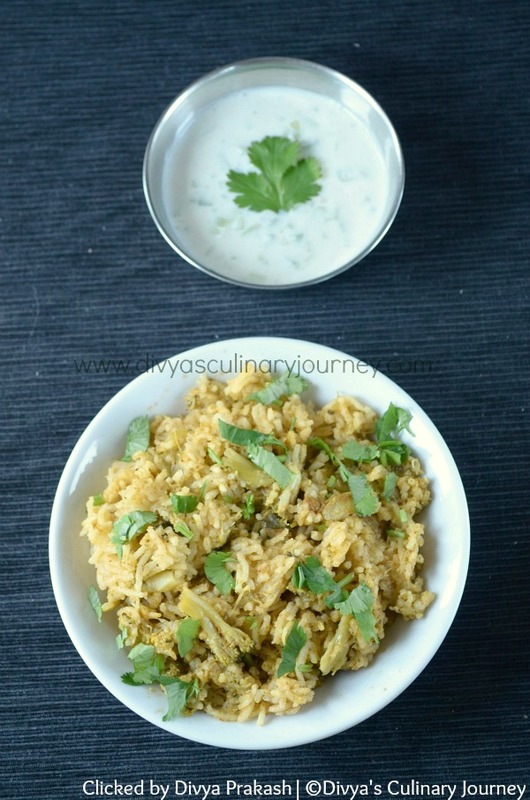 This Flavorful Broccoli Biryani is a one pot meal cooked using pressure cooker. It is quick, easy to make and delicious too. It is served with Raitha or other side dish of your choice. Star Anise : 1 no. Wash and soak basmati rice for 15 - 30 minutes(not more than that). Then drain the excess water and keep it aside. Wash, clean and cut broccoli into florets and keep it ready. Slice onions too. In a blender, take all the ingredients listed under "to grind" and grind it into a fine paste and keep it ready. Heat oil in a pressure cooker, add fennel seeds, star anise, bay leaves and fry for a minute. Then add sliced onions and fry till they are translucent. Then add the ground masala paste, along with turmeric powder, chilli powder, coriander powder, garam masala and mix well and cook for a minute or two. Now add the Broccoli florets, mix well, then add the basmati rice and required water and salt and mix well. Now close the lid and pressure cook in medium heat for 1 whistle. Then turn off the heat. When the pressure releases, gently fluff the rice up and garnish with cilantro and serve it warm. Instead of basmati, you can use other variety of rice too. 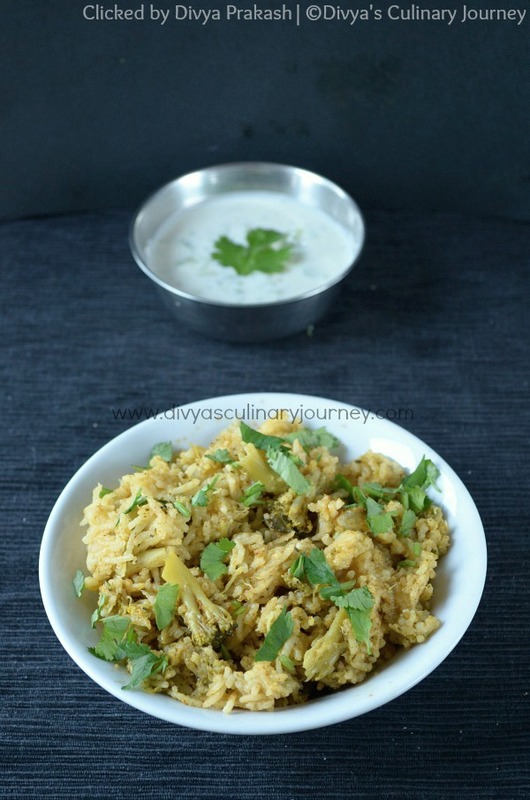 You can prepare this broccoli biryani in electric rice cooker too. In a pan, heat oil , add fennel seeds, star anise, bay leaves fry for a minute, then add the ground masala paste and along with turmeric powder, chilli powder, coriander powder, garam masala and cook for 1-2 minutes. Then add broccoli and mix well and transfer this to electric rice cooker, add rice along with required water and salt and cook till it is done. Adjust chilli powder as per heat tolerance level. OMG. .When I saw broccoli and biryani together, i thought I read it wrongly. Superb Divya..